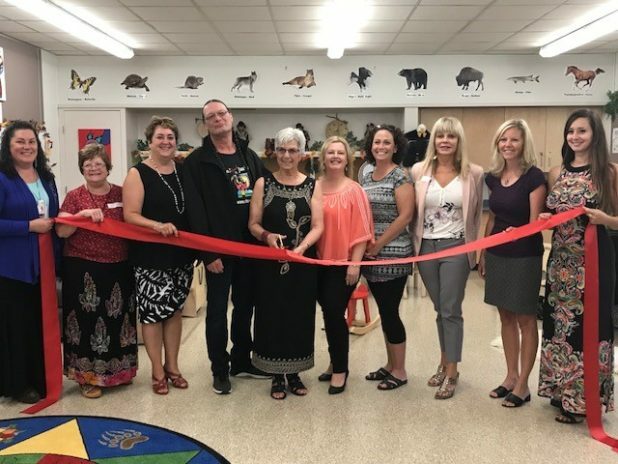 Some 200+ community members gathered at the Hastings Highlands Centre on the morning of Friday, Sept. 7 to celebrate the official grand opening of the Algonquin Inòdewiziwin Child and Family Centre in Maynooth. The pounding of drums and the sound of voices singing could be heard from outside Emond Hall throughout much of the day. The day began with a series of speeches by some of the key individuals who worked together to bring the new EarlyON Centre to the community. Acting as MC throughout the celebration was the Algonquin Inòdewiziwin (AI) Child and Family Centre’s program coordinator Christine Luckasavitch. Having recently taken on the position, she has been working with Ada Tinney, elder and planner with AI, and Diane Martin, AI program facilitator, on developing programs to engage children up to the age six with Algonquin culture. Because the centre is located within Maynooth Public School and is open daily Monday through Friday from 9 a.m. until 4 p.m., Luckasavitch said it has already helped increase awareness of what it means to be Algonquin. Having not had the opportunity to learn about her own culture as a child growing up in the area, she sees the new centre as a big step forward in terms of reconciliation. “Here is a true example of what reconciliation can look like, and how it is implemented in a community,” said Luckasavitch. As an elder of the Kijicho Manito Madaouskarini Algonquin Bear Clan and a community volunteer with several organizations including the Anishinaabe Baptiste Community Organization, Dora Yateman has been actively involved in transforming idea of an Algonquin-focused early childhood education centre into a reality. Acknowledging the many partners who dedicated their time, energy and funding to the initiative, she shared her enthusiasm for this valuable new resource now available to families in North Hastings. “This collaboration gives us the freedom of endless possibilities,” Yateman said. Based on a network of partnerships, the establishment of the Algonquin Inòdewiziwin Child and Family Centre has been a community effort, with people from multiple generations chipping in to make it a success. For example, the centre’s logo was designed by Yateman’s daughter Lesley Trimbee and grandson Joey Kennedy. North Hastings Children Services will play a supporting role by providing assistance with administrative duties and collaborative programming. NHCS executive director Jessica Anderson is another of the key partners responsible for bringing the Algonquin Inòdewiziwin Child and Family Centre to Maynooth. Addressing the crowd, she said the new centre, combined with the co-facilitated programming at the Bancroft EarlyON Centre will benefit both Indigenous and non-Indigenous families in North Hastings. Offering programs on subjects such as engaging parents and caregivers, supporting early learning and development, and making connections for families, the core services at the centre will be the same as all EarlyON Centres. The Indigenous-themed programming, however, will add another layer of learning for local children and families. “The centre will also include cultural celebrations and include careful acknowledgment, respect and an understanding of the difference and complexities of the Algonquin worldview, culture and language,” said Anderson. Expressing his gratitude to the many contributors to the initiative since its origins, Chief Stephen Hunter of the Kijicho Manito Madaouskarini Algonquin Crane Clan highlighted the significance of the new centre. Noting that such a development would not have been possible during his father’s lifetime, he considers the mere existence of the Algonquin Inòdewiziwin Child and Family Centre to be a sign of progress. “I had a father that hid in the bush to burn his sweetgrass, only when he thought it was safe to do it outside of the eyes of other people,” said Hunter. The celebration featured ceremonial performances by the Shawashkong Ikwe Singers, the Broken Arrow Singers and the Pikwakanagan Dancers. Although staff are still in the process of developing programs for the Algonquin Inòdewiziwin Child and Family Centre, there are already several programs being offered. For instance, every Tuesday from 6:30 p.m. until 8 p.m. at the Bancroft EarlyON Centre there are free Annishinaabemowin language classes led by cultural and language coordinator Michele Gaudry. Each month on select Tuesdays, Trevor Pearce of Broken Arrow Singers will also be offering drum teachings from 6:30 p.m. to 8 p.m.
For more information on the Algonquin Inòdewiziwin Child and Family Centre contact coordinator Christine Luckasavitch at c.luckasavitch@nhcs.ca, elder and planner Ada Tinney at atinney@nhcs.ca, Jessica Anderson at janderson@nhcs.ca; or call 613-332-0179.